How Many Carats Should an Engagement Ring Be? For many people, the size of the center gem is the first thing they notice on an engagement ring. There's no official guideline about how large your center stone should be, since the design of the ring, your budget, and your personal preference are all huge influences on the size of gem you choose. However, it helps to know what carat weights fall within the range people expect. According to The Knot, the average engagement ring had a center gem of 1.2 carats in 2017. If the ring had more than one gem, the average total carat weight was 1.8 carats. Keep in mind, this is only the average - not the expectation. The average gives you a baseline, but it doesn't tell you what your gem should weigh. 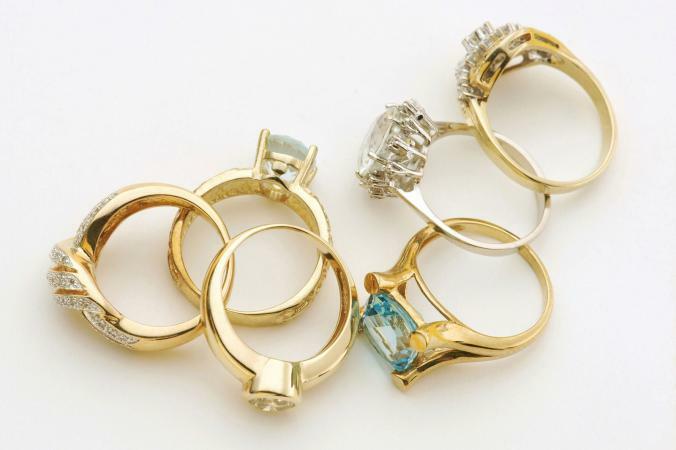 Choosing a gem for a ring is a very personal decision that depends on several factors. Understanding and prioritizing those considerations will help you choose the right carat weight. Keep the following tips in mind. It's important to remember that carats are a unit of weight, not a measurement of size. Depending on how it is cut, a one-carat gem may look much larger or smaller. Four Mine reports that a one-carat diamond with a round cut may be 6.5 mm in diameter, but a princess cut diamond of the same weight is only 5.5 mm. Additionally, cuts may vary depending on the jeweler, with one-carat diamonds coming in at a variety of sizes. There's no set guideline about how much you should spend on an engagement ring, but you do need to determine your budget before you start shopping for a stone. All other factors being equal, larger carat weights are going to cost more. The number of carats a ring should be is the number of carats that fit comfortably in your budget. Another important consideration is the finger size of the person wearing the ring. If the bride-to-be has wide fingers, she may look gorgeous wearing a ring that's two carats or more. However, if she has delicate hands, a large gem may look out of place on her finger. The carat weight of the gem is only one part of its perceived size in a ring. Side stones, halos, and other design elements can make a stone appear larger. Additionally, many engagement ring settings are made to accommodate a certain size of gem. If you choose one that's too large or too small, it won't sit properly on the ring. A large gem can be lovely, but it's not the ideal choice for everyone. If the person wearing it works with her hands or needs to avoid high profile gems for other reasons, a smaller stone may be a better option. Similarly, some people prefer the simplicity of a smaller stone. These factors are very important when considering the right gem size for you. Dying to know how a ring compares to the national average? Whether you're admiring a friend's ring or wondering about the details of your own, Who What Wear reports that it's not polite to ask about the carat weight. It's proper etiquette to ask about the shopping experience. You might ask, "How did you find such a lovely ring?" However, specific cost and carat questions are best kept to yourself. Ultimately, the right size of gem is the one that captures your heart and makes you both happy. Some people prefer smaller diamonds, and a huge rock isn't in the budget for every couple. Your engagement ring should be the number of carats that fits your budget and lifestyle.